Once again this is SilentMode of SilentMode.tv, and you’re joining me on my 100th review (40th review this year)! There’s still one more review in the works before I retire for good, but I wanted to slip this one in due to my thoughts on the set as well as LEGO Ideas in general. August 1st saw the official release of the Research Institute: the eighth LEGO Ideas set and the second non-IP project to reach the goal of 10,000 supporters and approval by the LEGO Ideas staff. You may remember that this particular project has survived its own round of reviews (where the Exo Suit was chosen), and controversially – but understandably – knocked out the entire Winter 2013 line-up, which I had a few choice words to say about. Maybe even more so than the Exo Suit, I wanted to get my hands on this particular set, to lay down the law once and for all. Let’s find out what I make of this set, in what might be the first ever comprehensive review. The first thing you’ll notice on seeing this set in the store, or delivered from the online shop, is that the box is small: even smaller than the one for the Exo Suit, which itself was a reduction compared to The DeLorean Time Machine and Ghostbusters Ecto-1. The box is also uncomfortably light, leaving you wondering what exactly you’re buying. The design on the box, however, makes up for it: very modern and stylish. The design continues on the back of the box, where once again we’re reminded that you too can have your idea for a set turned into reality… if you happen to have a horde of angry feminists or fanboys to help you reach 10,000 supports, and are lucky enough to be chosen for the honour. 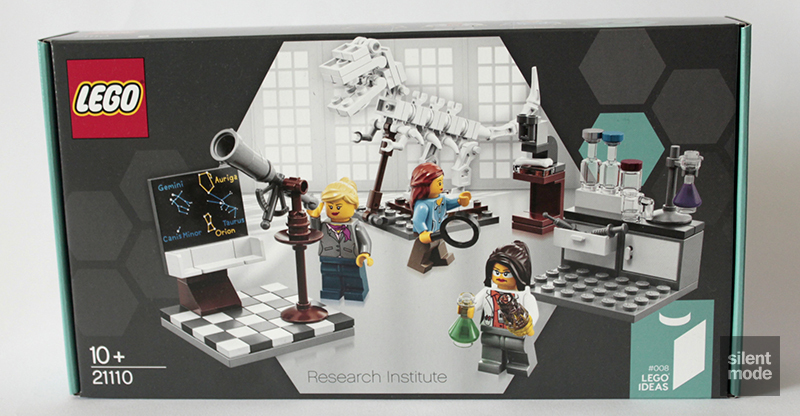 As you know, the main draw for the Research Institute was the fact it was an all-female regular minifigure set, possibly the first of its kind outside of a female-centric theme. All three figures in this set grace the side of the box, with a looking-glass serving as the scale reference. You’ll notice that the instructions for this set doesn’t have the same hard covers as the previous sets, but uses higher quality paper than usual throughout. Again, the design carried over from the box makes up for this difference. Oh boy, the feminists aren’t going to like this. Gracing the back of the instructions is two-time “WIN” champion whatshisname, armed with the Mug of Doom. Will he be able to claim a hat trick? Right in the inside cover is a photo of Alatariel – the lucky project owner – in her natural habitat, with an overview of the set and how it came to be. She explains that the three vignettes featured in the set were the most popular ones, as chosen by her loyal activi… supporters. You’ll notice there’s no mention of a set designer, and that’s because – with the exception of a few aesthetic changes – the official set is virtually the same as the original submission. Speaking of the vignettes, a page each is dedicated to a description of what the associated professions involves. The instructions of each of the vignettes are also accompanied by some relevant and stylish designs on the pages. In a first for a LEGO Ideas project, this set comes with three numbered bags: each corresponding, of course, to a vignette. Of the three bags, this one has the most appealing set of interesting parts in my humble opinion. I don’t think there are any new parts in this assortment, but it’s great to have another set of flasks and bottles – and Medium Stone Grey syringes! 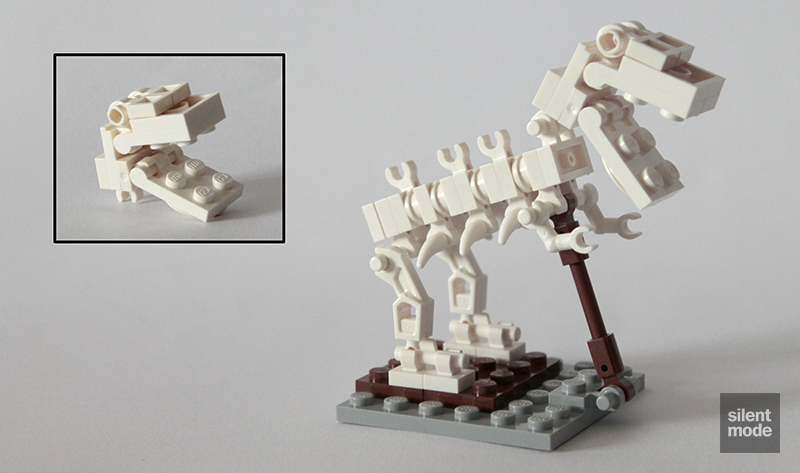 – for our scientific-themed MOCs. If you’re still hyped about the 1×1 round tiles, we have three kinds in this set too. I almost wish I could say those are Dark Azure 1×1 plates and 1×1 round tiles, but unfortunately that’s the custom white balancing at fault. 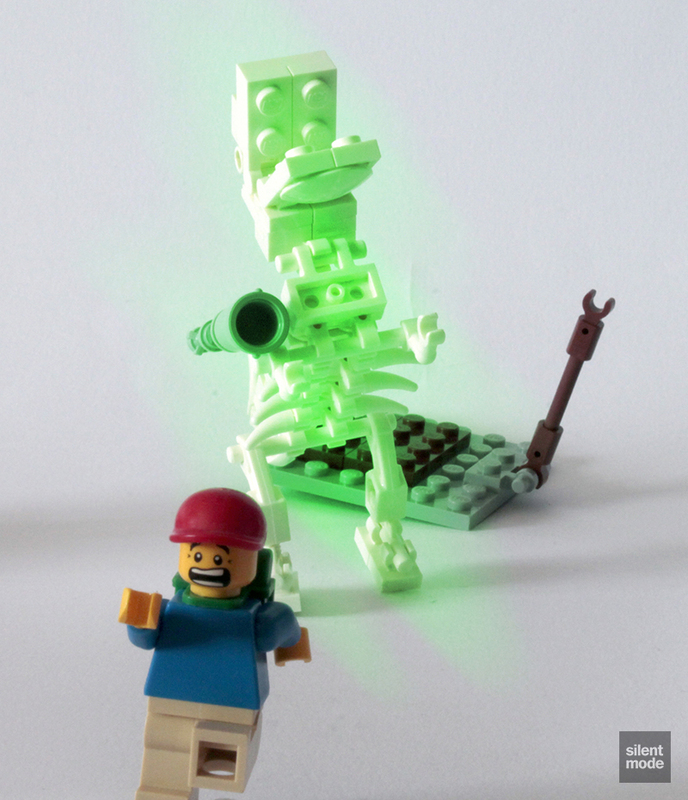 Following in Peter Reid’s footsteps, the project owner has been essentially immortalised as an official minifigure, appearing with a unique torso and dual-sided head. For some reason, neither side has a smile on its face – I guess it’s because chemistry is serious business. So those syringes and Transparent mugs go inside these cabinets, which are placed on the first of three 6×6 Medium Stone Grey plates. After reviewing all those Friends sets, it’s refreshing to see both drawers in a cupboard. The rest of the laboratory is very straightforward to put together, and in no time you’ll have the scientist concocting all kinds of experiments. Yet another Hollywood brick separator is at your disposal, as well as a large number of small parts left from the first build. I guess if the Exo Suit didn’t get a separator in a new colour, this set wouldn’t either. Some of the more technical parts can be found in this bag. First up, the White nozzle handles (right) are currently exclusive to this set, and they look particularly cool in that colour. The Reddish Brown bar holders appear in 76020 Knowhere Escape Mission from the Guardians of the Galaxy theme, where there’s six of them. 70812 Creative Ambush from The LEGO Movie has six of the Reddish Brown 1x2x2 panels, with its only other appearance being in 4867 Hogwarts. 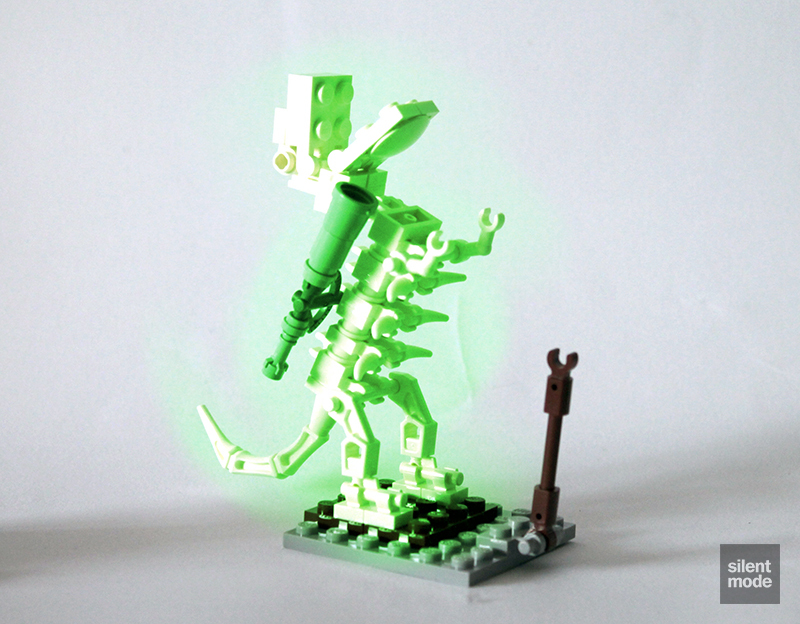 That odd-looking bone tail part is more commonly known as a “spider leg” or “scorpion tail”, and has appeared in the Ninjago, Legends of Chima and TMNT themes; this is its first ever appearance in White. This is the most generic of the three female minifigures in the set, and you’ll probably be able to recreate this one from parts in a Build-A-Mini station, all the way down to the head. Yes, that head… I’m tired of seeing that particular head, given they were so prominent in my first ever reviews. Anyway, the Palaeontologist comes with a Black looking-glass, which actually works if you care about that kind of thing. She’s got that angry, bitter feminist kind of vibe about her. A classic piece of equipment was donated to the Research Institute by a well-to-do university. There have been a few minifigure-scale microscope builds in official sets, and this one looks like it came fresh out of a university’s science department… I assume so because of the Reddish Brown “wood”. Work begins of the biggest talking point of the set by far (besides the female-only aspect), the dinosaur skeleton. One part I forgot to mention were these relatively new 1×1 modified tiles with the new style clip, resembling minifigure hands. These are currently exclusive to this set in White, so hold on to them. The body of the skeleton is an assortment of 1×1 round plates, 1×2 plates with clip and 1×2 plates with old school handles, all in White. 10244 Fairground Mixer is currently the only other set with the 1×2 clip plates in White. The skull is a very clever build involving the remaining small plates, and clips easily to the body. As soon as you’ve attached the dinosaur’s tail, you’re left with a completed skeleton of a tyrannosaurus rex, or whatever dinosaur is trending these days. For once, just once, the palaeontologist wishes she could study something else. 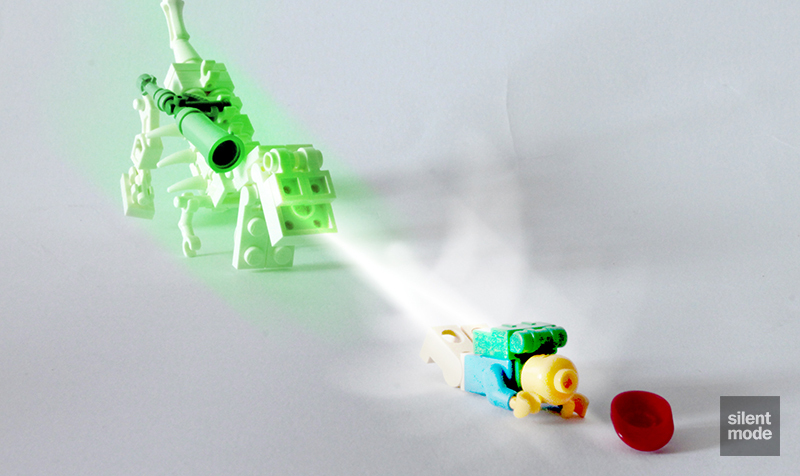 Parts for making your own skeleton are left over… or you could use that White nozzle part as a gun, like the rest of us. Only four other sets have the 2×2 dishes in Reddish Brown, and this could very well be the least expensive offering. The Reddish Brown whatever-it-is handle (top, second from right) appears scarcely in seven other sets, with the most being three in 10236 Ewok Village. Besides the minifigures, the only printed part in this set is the 4×4 blackboard tile (is what I’m calling it) in Black, with a few constellations marked on it for good measure. I’d almost thought it would be from a DSS instead! 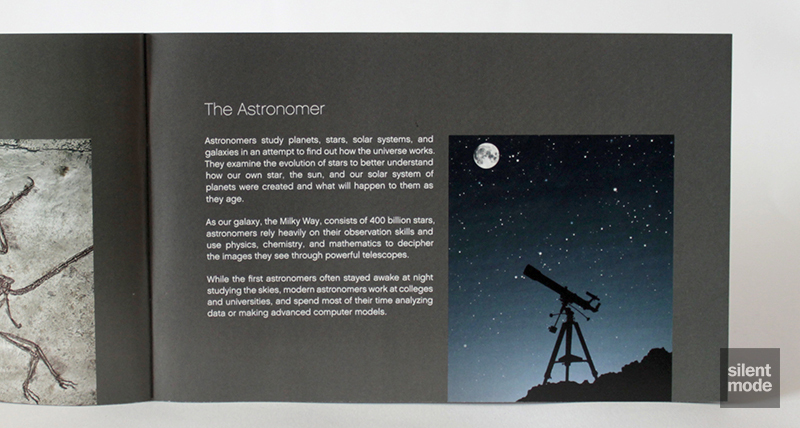 New to the workplace is the astronomer, fresh off of a career as an air hostess. Hey, I’m just going by what I see! The dual-sided head for this minifigure is recycled from Sharon Shoehorn (The LEGO Movie), as well as a minifigure from the aforementioned 10244 Fairground Mixer. The photo does a very bad job of showing it, but the legs are Dark Blue. What makes this vignette more appealing than the others is this tiled chequered floor. You’ve seen them being used in other people’s MOCs, and now you know how to create your own. The blackboard makes use of a hinge attached to the back to tilt back and forth. Somewhat humorously, a Medium Stone Grey bucket is used as the end of an old but still expensive looking telescope, also constructed using a sextant. In another clever move, the sextant connects to the wooden stand using the singular small pin on one of its sides. There you have it: one budding astrologer’s dream of using a classic telescope, fulfilled. 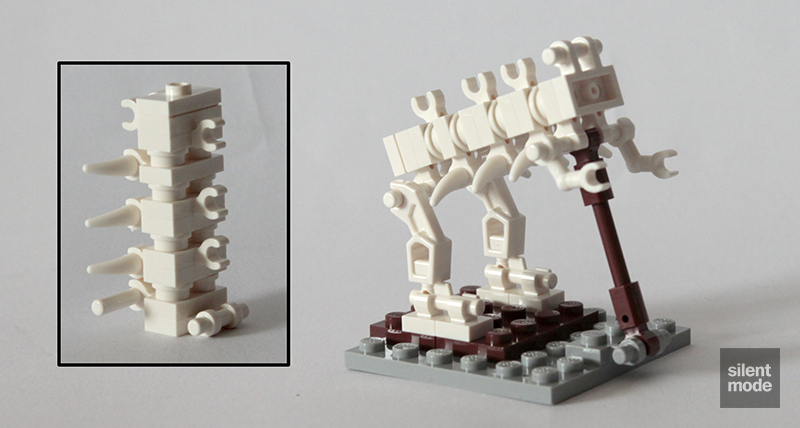 Some very useful parts for your own MOCs, though not quite enough for a tiled floor. 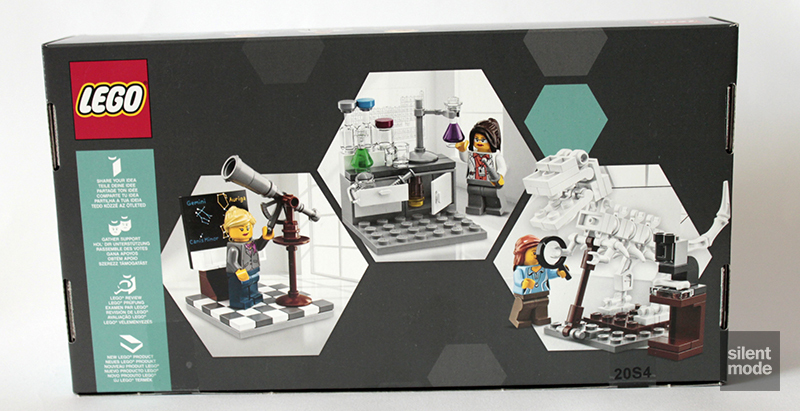 This is it, what everybody’s been waiting for: a female-only LEGO set. It really does look like the original submission, save for some notable changes. Something that mustn’t go ignored is that both the Exo Suit and Research Institute have exposed the true nature of LEGO Ideas. Whether we want to admit/recognise it or not, the whole thing really does boil down to yet another online popularity contest, where only those with enough clout stand any chance of success. Along with crowdfunding, it’s exposed a crabs in a barrel mentality among FOLs: the proof being in which projects have been successful, which projects get blogged and talked about, and the kinds of comments (or lack of) left about each project. All that talk about “presentation”, “business plans” etc. meaning anything is a lie. With that said, I’ve looked at the LEGO Ideas site in the last few weeks, and from what I’ve seen there’s nothing I’m excited about. Instead, there’s been a surge of copycat projects, particularly in the wake of the Ecto-1 – including what looks like another Research Institute. If we consider that those are safe bets and what people will vote for, it’s not surprising… but then let’s change the name of the site to LEGO Votes. Back to my verdict of the Research Institute. First, whether you agree or disagree with the concept of a female-only LEGO set, or whether you think the set design is too simple or not, one thing you can’t deny is that it’s another example of what LEGO Ideas is all about: taking a concept and eventually having it turned into a set. This is the result of one person’s vision – reflected in the instructions – and a heck of a lot of support, which is (hopefully) why it got made. That it was very close to the original design is encouraging for people to get involved with their own ideas for projects… not for me though, as my very minuscule following brings me back to reality. Second, the Exo Suit and Research Institute have essentially gone head-to-head, with both being officially released at the start of August. The Exo Suit has been far more widely promoted, while the Research Institute – at least in this neck of the woods – was quietly placed on the shelves. It has been selling, however, with its clear advantage being it costs less than the Exo Suit. In fact, I was surprised it wasn’t GBP 19.99 as I’d expected, although GBP 14.99 would have been more pleasant. Third and most importantly, there was never an issue on my part with Alatariel or the set itself, despite how my posts have sounded; I just didn’t like the feminism attachment (which led to the 10,000 supporters), being a non-feminist. With that said, since LEGO has made an effort to keep politics out of the whole thing, so will I. 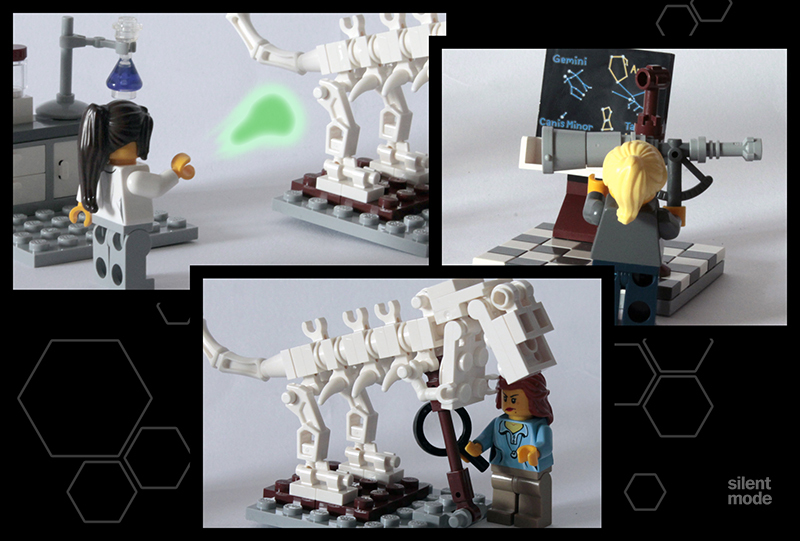 The dinosaur skeleton, the chemist’s equipment and her unique head are the highlights of the set. I can’t front; I was impressed with the building technique used for the skeleton, which can only come from knowing which parts to use and how to use them (something I haven’t done as much as I’d like in the last year). I’d echo the sentiments that there should be tiled floors for all the vignettes instead of just the astronomer’s domain. The laboratory could have had a wooden floor (Reddish Brown 1×2/1×4 tiles), and the dinosaur could have been accompanied by a marble floor (1×2/2×2 Medium Stone Grey tiles). Of course, we can make these modifications ourselves. Besides what happened behind the scenes, the one thing that irks me about the set is that it’s neither incredibly good nor bad; everything seems to balance right down the middle. The price is ripe for people to buy multiples if they want to; personally I wouldn’t buy another one, although I wouldn’t have felt comfortable foregoing it entirely. I would have flat-out refused to give a score if it leaned any further toward feminism. Instead, I eventually decided on 6.6/10.